Watching the news on Wednesday night I sat there in total awe at Premier Redford again stating before the citizens of Alberta, that she supported the cull of your wild horses as they were having a negative impact on the environment. WHAT!! How would she know? Has she ever been out there to observe these beautiful animals co-existing with the other creatures? Has she observed how little of an impact that they do have on the environment? Again she is just speaking words put in her mouth by the bearucrats who also lack the research and science to back up any of their claims. Mismanagement of our natural resources seem prevalent in this province. Nobody on the government side brings up anything to do with the negative impact cattle are having on the natural environment within the forestry boundaries. 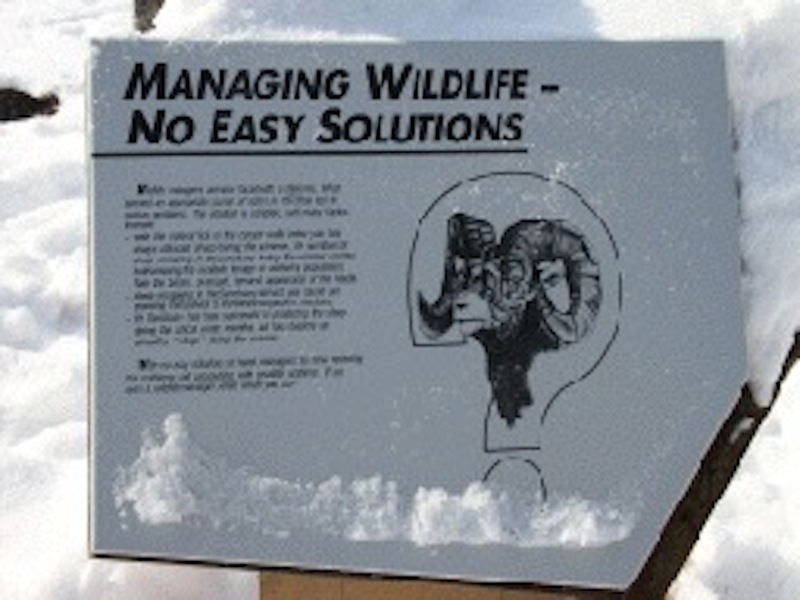 A great example of money before wildlife is found in the Sheep River country south of Calgary. Here the SRD had created a bighorn sheep sanctuary to protect the herds of sheep that inhabit the area. They then let in the cattle to graze within the sanctuary during the summer months. Today you find a sign there telling you that because the sheep do not want to leave the safety of the sanctuary they are eating all the food resources and may become prone to lung worm. Just down the road however, is a sign telling visitors that they allow the cattle to graze here, to reduce the bio-mass in order to improve the sheep range. So the cattle can eat it but the sheep are destroying it? Little is said about the massive clear cutting that is going on in our foothills. Where the clear cuts are being taken right down to the creek, muskeg and river edges, therefore providing little protection of these resources from excessive runoff from the rains and melting snow. Nothing about the astonishing toll of small mammals that are killed or displaced because of it. Nothing about the destruction of the habitat of so many of our Canadian bird species that use these areas for their breeding and nesting areas. Nothing about the huge amount of carbon that is released into our atmosphere by this clear cutting, therefore affecting our weather and increasing global warming. Let alone the destruction of the micro-organisms that give the forest the healthy conditions needed to perpetuate itself. The other point always brought up is that your wild horses are taking away the grasses needed by the other wildlife. It is because of the horses that there is so much less deer, elk and moose, it is claimed. Nothing is said about fragmentation of the habitat and migration routes of the elk and grizzly bear, causing them to seek out alternative habitat outside of the forestry areas. Also when I talk to many old-timers during my research, they tell me that back in the 1970/80’s there were many more horses than there are today out in the foothills but also that there was large herds of elk and deer and lots of moose. All co-existed without having a negative impact on the other. When blaming the horses and/or the wolves for what is wrong in our west country no one from the government or opponents to the wild horses are willing to admit that these other factors are having an effect. The only scientific research done is way back in the 70’s by Richard Salter, that showed that there is little conflict between the species who co-habitate these regions. 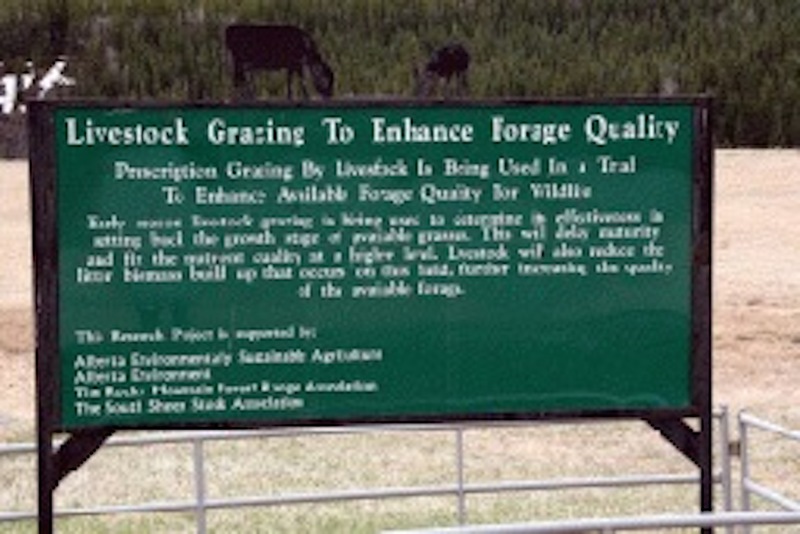 Research by Irving in 2001 showed that the horses have little affect on the regeneration of seedlings within re-planted areas. Yet without scientific evidence or research the false accusations against your wild horses continues, even by the Premier of our Province. 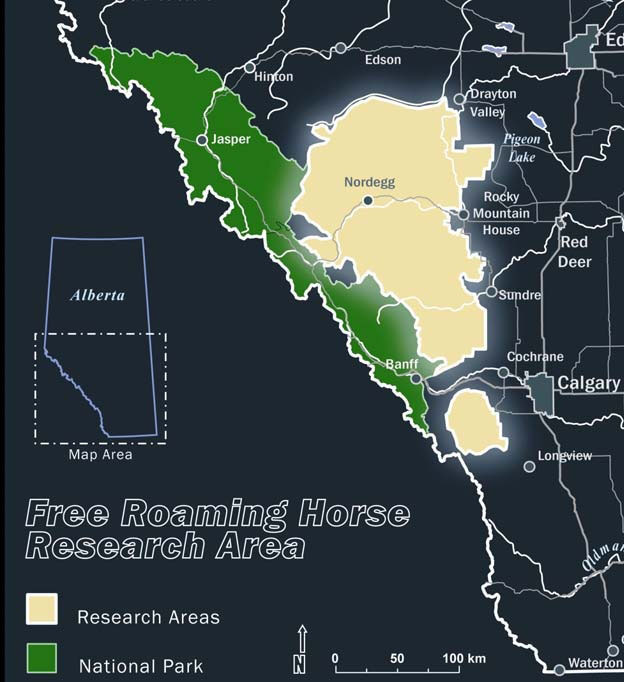 Therefore in this vast area lives, according to March 2013 count, 980 wild horses. How many are too many, no one in the ESRD knows. They just say there are too many and their numbers are ballooning out of control. Really? High foal mortality in 2012 and 2013 are not noted. 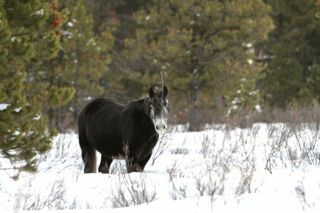 The devastating toll that mother nature is taking on all wildlife and the horses was not considered before a capture season was declared this year. 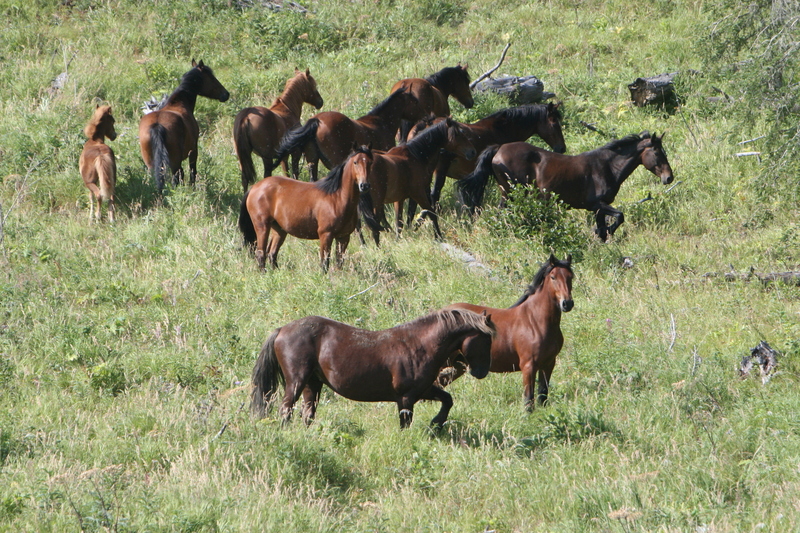 WHOAS has always maintained that yes, the wild horse numbers have to be managed properly. Current practises are not the way to manage them effectively. WHOAS has solutions to help, but we and a great majority of Albertans, are ignored. The current government advisory committee that was set up was engineered for a specific outcome by the ESRD. That outcome was to go ahead with the capture of 196 head of horses this year, over 20% of the total population of your wildies here in the province. No other result was wanted, but this drastic reduction. Also there were so many comments put before the public to defend this action which were not true. With the support of other groups and a growing number of Albertans we hope that things can be changed in the future. A contraception program, re-designation of the wild horses out of the category of feral and being governed under the Stray Animal Act and (only if absolutely necessary), a compulsory adoption program of any horses that may have to be removed from a certain area. 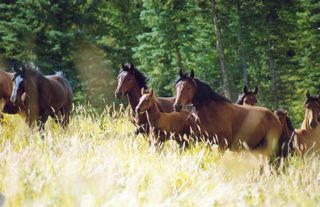 Having the wild horses re-designated is strongly opposed by those opponents who wish to continue to treat the horses with the disrespect and callous attitudes they have now. In the future it is hoped that maybe in the management strategy, only the specific areas where the wild horses may be causing a concern, would their numbers be looked at. Instead of looking at the horses as having no financial value, like other industries, to consider them with an aesthetic value and a huge potential for an eco-tourist resource. There is a better way and it is about time the government of Alberta leave behind the old prejudices and look at our wild horses for the significant value that they have given us in both our history and culture. WHOAS and other concerned Albertans will continue to fight for this now and in the future. So, let me get this straight – cattle are now being touted as potential saviors of the grasslands, to benefit the local wildlife? They have been free on that land way before man settled the area, the land belongs to them, we have to protect their rights since it seems that the government sees them only as problems. What they actually are is beautiful intelligent animals that just want to be able to roam. There is enough land in Canada for everyone and all animals why take the chance of destroying them by culling, weather conditions and accidents, illness, and other issues usually do the job of controlling the numbers.